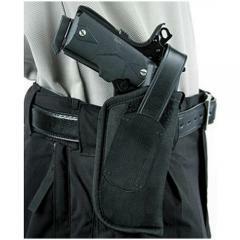 The Blackhawk Nylon Hip Holster with Thumb Break is a simple style designed for durability and ease of use. It is made from high-strength 1000 denier Cordura nylon fabric, making it extremely wear-resistant and waterproof. It features a non-stretching retention strap that keeps the firearm securely inside the holster pocket while still allowing easy access to the grip. Its molded thumb break allows you to release it quickly and easily for a fast draw under pressure. It is available in left and right-handed configurations, and its dual slot belt loops allow it to be worn on a dress or duty belt. Holster is made to fit gun only. Check out the "Blackhawk Nylon Laser Holster" part no. 40LH02BK.